Nortek Security & Control’s (NSC) Gefen brand is now shipping six new models from the Gefen Gen 2.0 AV-over-IP product line, featuring DVI KVM, VGA KVM, and audio-only input and output formats. The Gen 2.0 KVM, AV, and audio products offer an expanded array of input and output formats, improved performance, and enhanced functionality such as 4K Ultra HD with HDR support, built-in scalers, video wall control, independent USB, RS-232, IR, audio routing, and backward-compatibility with first-generation products. HDMI and DisplayPort products feature maximum input resolution of 4K60Hz 4:2:0, and maximum output resolution of 4K30Hz 4:4:4. HDCP 2.2 and 1.4 are also supported. The DVI and VGA models support VESA and CEA resolutions up to WUXGA (1920x1200 at 60Hz) and 1080p (1920x1080 at 60Hz). The Sender units (except DisplayPort) feature a video output for local monitoring of the source. USB, RS-232, two-way IR, and audio can be routed independently between any sender and receiver unit, allowing end users to control any of the sources and the displays within their network. The new Digital and Analog Audio over IP units allow integrators to add audio-only nodes to an installation. Each receiver can play back audio from any of the Gefen AV-over-IP sender units, including audio de-embedded from HDMI inputs. These senders and receivers can be used for multiroom music, conferencing, public announcement, and live-venue audio projects. All KVM and AV receivers feature a built-in scaler to help optimize the image on a variety of displays and viewing environments. They also include a video wall controller that accommodates any screen configuration up to 16x16 and provides flexibility in sizing and manipulating live and signage content for installations such as sports bars and restaurants, or in corporate, education, hospitality, and retail establishments. Digital and analog audio breakout on HDMI, DVI, and DisplayPort receivers allow audio that is embedded into the video to be sent to a separate audio system, enhancing the impact of presentations in large venues. HDMI models pass 7.1 channels of HBR (High Bit Rate) lossless and LPCM digital audio from source to display. The receivers’ integrated USB hub with two USB 2.0 and two USB 1.1 ports accommodate touchpanels, keyboard and mouse, and a variety of supported devices. Along with analog audio inputs and outputs, this make these products perfect for collaborative and interactive installations. To ensure maximum versatility and compatibility, the audio outputs on the KVM receiver units are compatible with both headphones and line level devices such as powered speakers. A built-in two-port Gigabit switch on each receiver allows the daisy chaining of additional receivers or other IP-enabled devices. In applications such as digital signage, where content is often replicated on multiple displays throughout the installation, the ability to cascade the receivers removes the requirement for each cable to be run directly to the main network switch. This extends signal range beyond the limits of a point-to-point video distribution system. The sender and receiver can be used as extenders in a one-to-one system, or as nodes in a virtual matrix environment where any source can be routed to any or all displays, supporting up to 39,900 senders and a combination of just over 65,000 senders and receivers. Their small, half-rack-width enclosures are well suited for rack mounting using the Gefen EXT-RACK-1U-GRY rack tray. They can also be surface mounted, placed on a shelf, or hidden away behind a display or in the equipment closet. 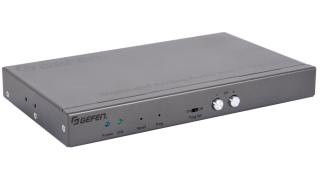 All Gefen Gen 2.0 AV-over-IP products have been specifically designed for use with the Gefen Syner-G software, available for download at www.gefen.com. “Each product in the new Gen 2.0 AV-over-IP line provides systems integrators with scalable, high-performance routing and distribution that set new standards for performance and reliability,” Fitzgerald said.